RESEARCH TRIANGLE PARK, NC—Following a nationwide call for ideas and a day-long Misinformation Solutions Forum at the Aspen Institute in Washington, D.C., three multidisciplinary teams have been named as winners of the first Misinformation Solution Prizes. They will receive a total of $100,000 in grants to fuel development of novel ideas to reduce the spread of misinformation and minimize its influence. The winning ideas seek to foster motivation and tools for confronting misinformation, focusing on the needs of rural and urban youth as well as users of social media platforms like Facebook. Mind Over Chatter is an educational intervention for first-year college students that focuses on mindfulness training, aiming to reduce the effects of biases and empower students to be responsible researchers. The curriculum engages older students in instruction and also seeks to increase student retention among a largely rural, underserved population. It contains three components: initiation in skills and tools, protection against biases by learning about factors that make humans prone to misinformation, and strategies students can use to protect themselves from influences of misinformation. Building on the success of a KQED program to help teens develop media literacy skills, Go Above the Noise uses short-form activities where students read interactive blog articles and respond to questions, using evidence to back their claims. Students can interact with others across the country to develop media literacy and civic engagement skills. KQED also integrates youth into the editorial process for the program. Let Me Fact Check that for You helps people verify and contextualize information using simple, teachable verification techniques. The service will allow people to paste in a URL that requires fact checking, answer a question or two, and produce a custom linkable infographic that will show the step-by-step process of checking a specific claim and website. The resulting link can then be shared—for example, as part of a dialogue on social media. Each of the winning teams combines different types of expertise—including in education, media production, technology, behavioral science, and social science related to information sharing. Their ideas were further developed at the Misinformation Solutions Forum in October, where cross-sector participants, including data scientists, journalists, funders, and 12 graduate student fellows, came together to workshop the six finalist projects. Much discussion of misinformation highlights how much inaccurate information is available online or in news media. 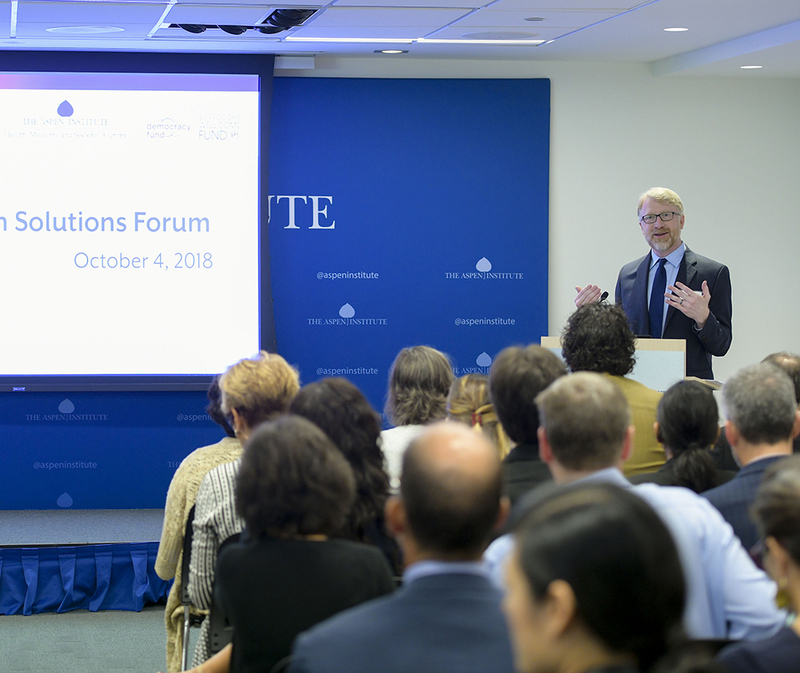 The Misinformation Solution Forum approached the problem from a new angle by building partnerships focused on addressing the human behaviors and motivations behind information sharing. Following an open call for ideas in March 2018, the six finalists were selected from more than 75 proposals by a panel of expert judges. The three winners were chosen by a combination of judges’ rankings and feedback from participants in the Misinformation Solutions Forum. The Forum and prizes were presented by the Rita Allen Foundation and RTI International in partnership with the Aspen Institute, with additional support provided by the Burroughs Wellcome Fund, Craig Newmark Philanthropies and Democracy Fund.